Salmonella is one of the top causes of foodborne illness, affecting 88,000 Canadians a year. Although commonly associated with undercooked chicken, salmonella on fresh produce can also make you sick. Wilfrid Laurier University Associate Professor Joel Weadge is trying to do something about it. 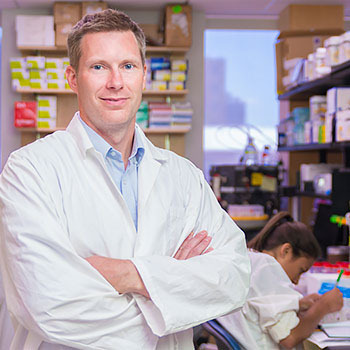 Weadge, a faculty member in the Department of Biology, is part of a large, multi-institutional project called Salmonella Syst-OMICS. The project focuses on controlling salmonella on fresh produce, such as lettuce and tomatoes, which are often eaten raw. Weadge is performing research into understanding the survival of salmonella and combining that with using viruses that are safe for humans but deadly to bacteria to create a natural spray that kills salmonella. He received $137,000 in funding through the Ontario Research Fund Large Scale Applied Research Project and over $120,000 from Genome Canada for his part in the project. Salmonella is a bacterium that lives in the digestive tracts of humans and animals, as well as elsewhere in the environment. This bacterium can contaminate fresh produce when animals pass through or fly over farm fields and perhaps when manure is spread as fertilizer. When ingested, salmonella can cause diarrhea, vomiting and fever, which can be fatal, especially in seniors, young children and those with weakened immune systems. Even for people who develop mild symptoms, salmonellosis can lead to needing health care and time off work, which has economic costs. Although people tend to imagine bacteria floating around freely in the environment, that’s typically not the way they work, says Weadge. Biofilms can grow on all kinds of surfaces, including soil, packaging, the surfaces of plants and perhaps inside plants. Viruses could potentially destroy salmonella and their biofilms, says Weadge. Weadge is part of the project working to determine how long salmonella can live on the surface of food crops, what viruses are most successful at attacking salmonella, and how to develop a virus-based cocktail that would eradicate the bacteria on plant surfaces. If he and his team are successful, they will work with industrial partners that grow fresh greens and tomatoes to try the agent on their plants. The hope is that it will lower the health risks associated with salmonella and lead to fewer food recalls, which will reduce both waste and costs. “Ultimately, it will benefit you and I, the consumer, because we’ll be eating cleaner food,” says Weadge. Other members of the larger project are working on sequencing the genomes of the many types of salmonella that exist in order to determine which are most dangerous. Others yet are working on developing methods to rapidly detect and determine which strain of salmonella is present. “The policy right now in Canada is that one salmonella is too many. So if it’s found on fresh produce or any type of food, it has to be thrown out. There are huge economic losses that go along with that,” says Weadge. “On the other side of the project, they’re trying to change this policy that one salmonella is too many because there are over 2,500 serovars, or types, of salmonella. Some of them are very dangerous and others are more benign. So if you can identify particular strains, you might not have to throw out as much food. For his part of the project, which runs until 2019, Weadge is the principal investigator working with people at several universities in Canada and the United States, as well as with industrial partners and agencies including the Public Health Agency of Canada and Agriculture and Agri-Food Canada. He is also working with a number of Laurier undergraduate students and technicians. “That’s the beauty of this – it’s bringing together expertise from all these different fields to see what we can do,” says Weadge.